Ten preset rhythms plus individual kit pieces so you can program your own • Light, snappy vintage tone perfect for complex and agile rhythms • Tilt EQ for easy added punch or air • Combine rhythms for wackadoodle weirdness! 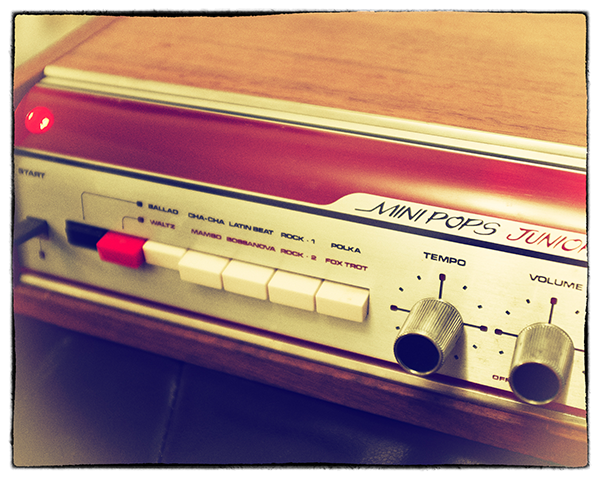 The Korg MiniPops Junior is a smart-looking little analogue drum box that kind of gives off the vibe of a 1950s Buick – all smooth lines, chrome trim and candy-apple red paint. 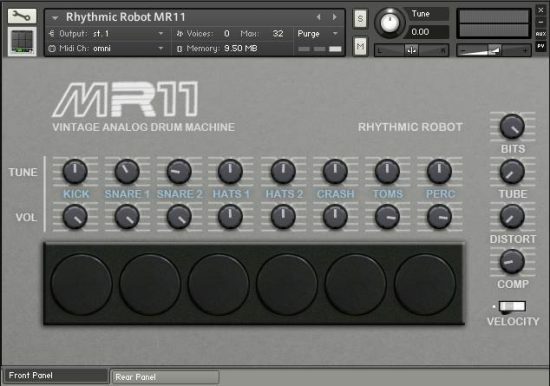 To our eyes, it’s one of the best looking drum machines out there: it’s even got a cool rolled top! 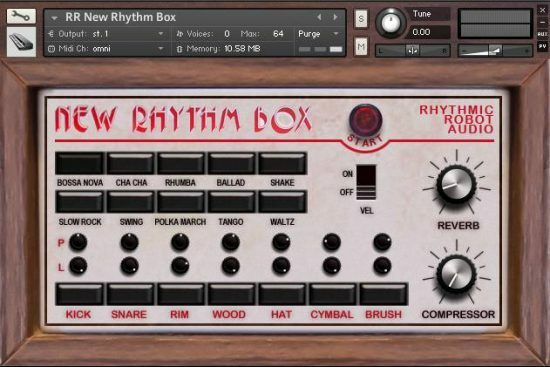 Onboard are ten preset rhythms that summon up the charms of a bygone era, played on a kit that comprises kick, snare, hats and a woodblock. Functionally it’s simple, and sonically it’s rather tasty, with a sprightly tone that seems to work particularly well on busier patterns. 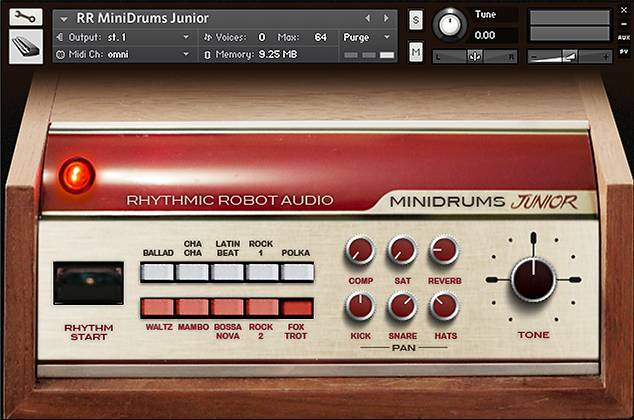 MiniDrums Junior is ideal for synthpop, electronica and all manner of alt-funky goodness: the original hardware found its way onto tracks by, among others, Roxy Music, AIR, and The Buggles (which frankly is endorsement enough for us). When you fancy a lighter, more refreshing chilled beverage drum machine, this is the one to reach for. Works great for dream pop or soft indie rock songs, basically works anywhere where you’d want a 70’s kind of sound. 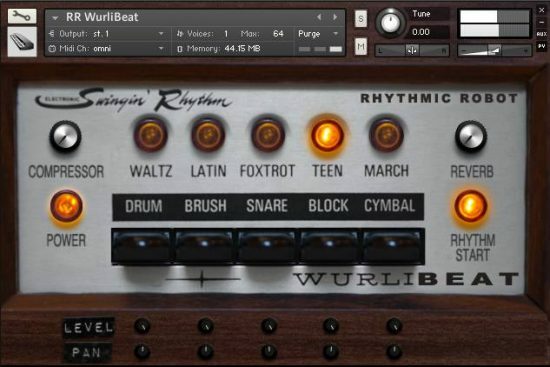 I’ve wanted this drum machine for awhile now, sounds so much like the real deal. Yes !! Finally my Buggles cover-band has proper drums for our rendition of “Vermillion Sands” (with appropriate built-in early digital reverb to boot) !! This is a nice, simple little kit, focused on what it does well, and with more tweaking potential than it might seem. Loads of character. In it’s unaltered, plain vanilla, bog standard (ok, you get what I mean) state, this…sounds just like a Korg Minipops Junior, with the patterns from the original, triggerable from the keyboard, as well as the individual voices sampled and assigned (and velocity sensitive) to notes also – all very DAW friendly (unlike the original). 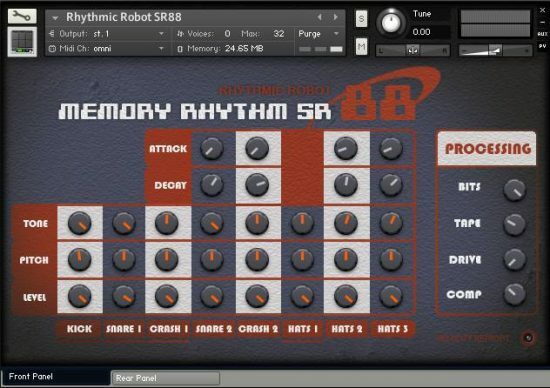 On top of that you get a tone control, you get to pan the individual kick, snare and hats across the stereo image (not the ones in the preset patterns) and you can add compression, saturation and reverb too. All wrapped up up in a retro 3D interface. For 6 euros! While a real one is desirable to retro peeps like me, they cost an awful lot more than 6 euros and aren’t anywhere near as useful for recording. No brain purchase.